What do Tableau fanatics do during the holiday season? You might create holiday calendars in Tableau. You might analyze the lines of A Christmas Carol, as Rody Zakovich did above. Or you might even write an entire Christmas poem about Tableau. Purchasing Tableau Pro this week is a sort of Christmas gift to myself and my business. Tableau sales manager Michael Powers and I were joking about writing a poem like this in advance of our sales call to purchase the software. I wrote the first stanza in 15 minutes, and I thought that would be as far as it went, but then I just kept writing more. After a while, I had to keep writing until I got to the “reindeer names” done as data types! The final product is amusing to me because I am both of the people in the poem from time to time: the addled consultant working late on a deadline and the data-crazed technophile telling someone about an awesome new technology they started using. I bet that’s true of lots of Tableau’s customers! I’m a tech consultant and I started working independently a few years back so that I could take my career with me wherever I go (my husband is an Army officer and we get moved around a lot). I love data and information visualization, something that has been a passion of mine for most of my career. 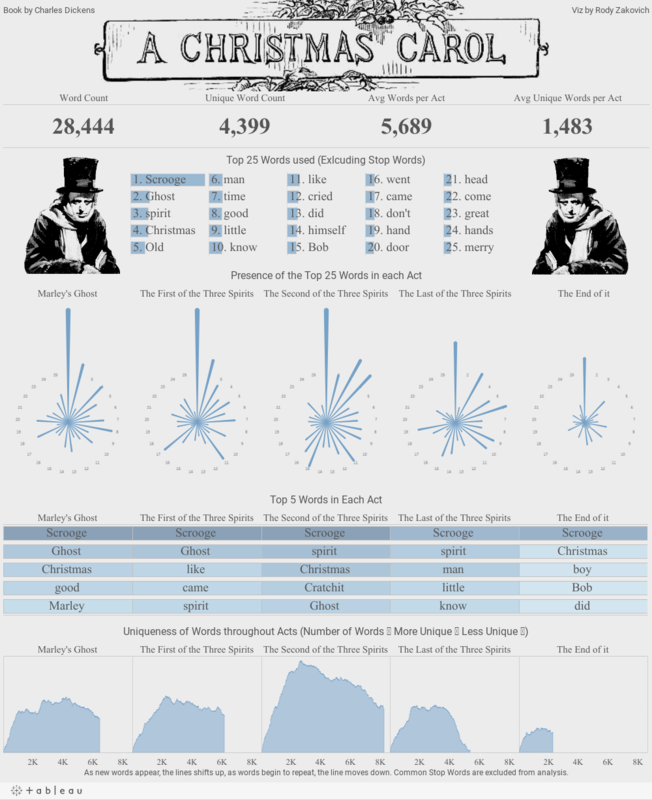 I worked with Tableau recently on behalf of a client and just fell in love with it: its speed, the appearance of its reports…to me, it feels magical. Best of all, it speeds of the process of my data analysis so that I can get to the heart of what I really love: helping my clients figure out what to do with the data they already have. And without further ado, here is Amanda's poem, a Christmas gift to all of us! Happy holidays! I was drowning in data, from Excel to Access. But I’d promised reports by the E of the D.
But I chase email timestamps to match what I said. I wish this were easier: in my dreams, it is art. From a dude in my list with a cat-bearded nose. I think he's from South, and his name is Nick Saint. He said "Are you really working? I hope that you ain't." But these reporting deadlines you wouldn't believe. from MySQL connections that do what they please." "Thanks for checking in, Nick, but I really must go." He said, "Why in the heck aren't you using Tableau? "It takes Snowflake, Kognitio, Salesforce, and Presto! Odata, MySQL, Firebird, and Marketo! Impromptu reports will look like they took ages. Preset monthly reports can have pages and pages. You can pivot your data sans brain aneurism. Make a heatmap that won't cause political schism. Make a bullet or gantt chart from all kinds of metrics. With no queries to write: no, no, none of that stuff! It's cool!" he declared, but I said "That's enough! Where were you last week with this new information? I've no time to adapt this to my situation." "More chart types than at which you can shake a stick!" He cried, "Boxes and whiskers; the treemaps are sick! I swear it's like magic that just never ends. “If you want more detail, just click a small button! Add dimensions and measures just like it's nothin'! Histograms, pie charts, did I mention the maps?!" I said, "You're getting worked up...maybe you need a nap? I will give it a try: 'Goodnight, Nick,' I must say!" "Get yourself a free trial! Tableau makes all things right!"